One of rock music’s most colorful raconteurs, Cousin Joe was born Pleasant Joseph in 1907 Louisiana and was a professional entertainer since the 1920’s but didn’t cut his first sides until 1945. Two years later, at 40 years old, he floated into the rock scene with a series of sharp witty records which mostly came and went without a trace though a few had some notable influence. 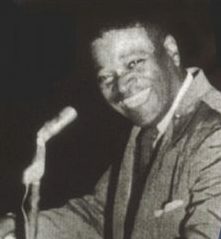 Comfortable in virtually any style of music – jazz, blues, gospel, rock – a warm vocalist with a metallic-tinged voice, a masterful songwriter and charismatic performer, Cousin Joe was more at home on stage than a studio and by the mid-50’s stopped recording altogether for seventeen years, choosing instead to play extended residencies at New Orleans clubs in between traveling the country. In the 1960’s he began regularly touring Europe to widespread acclaim and he revived his recording career in the early 70’s. One of the few early rock performers to pen an autobiography, the colorful Cousin Joe passed away in 1989 at the age of 81 but lived a lifetime worthy of twice that age.